Everybody these days has a loan – be it a car loan, home loan, personal loan, etc. Most borrowers approach a financial lending institution, with a loan amount in mind, ask for the interest rate and the repayment via EMIs, and go on to avail the loan. What many miss out are understanding EMI and use of EMI calculator, which is crucial to timely repayment of a loan and it affects the credit score. Contrary to the widely misunderstood meaning of EMI i.e. Equal Monthly Installment, EMI actually means Equated Monthly Installment. When a borrower takes a loan from a lender, then he or she repays an equal amount of money each month. This monthly payment to clear the loan is called EMI. EMI consists of the loan principal along with the interest payable. It is interesting to note that even though the EMI is fixed, the amount of principal and interest in the EMI changes regularly. In the initial period, Interest is the main component of EMI, but with time as borrower repays, the principal outstanding reduces, thus reducing the amount of interest. Thus, with time, EMI has a greater share of the principal amount. – E is the actual EMI amount that you need to pay monthly. – P is the actual Principal that you want to borrow/or you have borrowed. – r is the rate of interest. Normally, it is given annually, so you have to convert it into monthly bases to use in a formula. So, divide the yearly R by 12 and then multiply by 100. r = (annual interest/12) x 100. – n is the duration of the loan in a year. So, for 1 year, n is 12 and for 2 years, n becomes 24. This is the basic formula for EMI calculation that is used almost universally. However, there can be few banks or lenders, who will also ask for processing fees. The processing fee is different for each bank, so it may range from 1-3% depending, and in some cases, it is fixed while in others it is negotiable. Additionally, some banks may include it in the EMI, but most banks and NBFCs charge it upfront at the time of loan approval and disbursal. How the EMI Calculator Works? An EMI formula is a bit complicated especially for those who are not from a finance background. It can be confusing to calculate the exact EMI manually as there are multiple calculations and chances of mistakes are high. But, you can relax if calculations scare you. Use an EMI calculator which does the work quickly and correctly. In an EMI calculator, you need to enter the amount you want to borrow, the duration of the loan (also called the loan tenor) and the interest rates, and if applicable, also the processing fees. Click on the calculate tab or button to know the EMI amount. Keep in mind, it is a good idea to use the calculator of the bank from which you are planning to take the loan, as the EMI amount will be calculated more accurately. 1. Click here to go to the calculator given above on this page. Note – Though an EMI calculator is accurate, it is still an approximation. The borrower should confirm the EMI amount from the bank before finalizing a loan amount. Most of the EMI calculators available online provide three kinds of information. This is the actual amount that you will have to pay after availing the loan. As has been mentioned above, the payment is to be made monthly and it takes into account the loan amount, interest rate, and tenor. The EMI or the Equated Monthly Installments are the amounts a borrower is expected to pay after availing loan from a lender, which includes repaying both the principal and interest. It is the most important information provided since the EMI is on the basis of the decision about the affordability of the loan. The breakup is actually the total repayment amount broken down into principal and interest amount. A borrower should be aware that a small portion of the principal loan amount is deducted from the first EMI payment. Hence, as the tenor progresses, the principal amount to be paid in the EMI keeps on increasing while the interest to be paid is reduced. The equated installments take the repayment of the principal amount into consideration while calculating EMI. This is interesting information which is useful to understand the natural regression of your loan. It helps you understand how much interest and principal the borrower has paid at the end of each year, and how the balance between principal amount and interest payable changes year-on-year. Let us say the requirement is INR 10,00,000 INR for higher studies. With self-funds, the borrower can manage INR 2,00,000 but INR 8,00,000 will be required as education loan. Let’s assume the loan tenor chosen is seven years and the bank levies 10% interest but no processing fees. As is obvious, the annual payment remains constant at INR 1,59,371. However, the principal increases with each year while the interest decreases. It is important to note that even though the amount required was for INR 10,00,000, only 8,00,000 is needed as a loan. In some cases, such as home loans, banks and NBFCs are willing to loan only 70-80% of the property value, and the rest is required to be self-funded. So, it is necessary to know fund availability before approaching a bank. This amount is usually referred to as the down payment and while the remainder is the loan. Hence, 20-30% of the fund requirement is mostly covered by down payment and rest is covered by a loan. And, when you avail the loan, you also need to know the EMI to be paid to not be overburdened. The scope of errors in calculating the EMI is minimal. As mentioned above, it is an approximation, because of the changes a bank adopts. Manual calculations can be lengthy, tedious and result in mistakes by a large margin. Hence, using the EMI calculator is the best option. It makes the process of calculation, very easy. All the borrower has to do is input the information into the online calculator, and click on the Calculate tab. They need to ensure that the right information is filled in given input columns, to get the correct EMI. No need to calculate or remember tough formulas. EMI calculator will help in planning finances for the future. It can be used to calculate all types of loans including home loans, car loans, personal loans, education loans, and more. e.g. 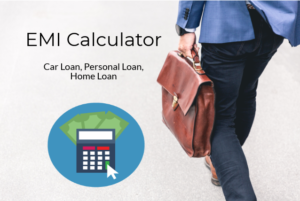 You can use personal loan EMI calculator to know the EMI amount in advance. Change the tenor, or interest rate or loan amount to get different calculations and finalize the amount and tenor most suited to repayment capabilities. It will help in comparing loan schemes of different banks. Instead of traveling to each bank to find about EMIs against the loan, simply use the calculator to find potential EMIs for each bank or NBFC loan. Approach financial institutions accordingly. Repayment capabilities of each individual differ. According to this capability, the need to calculate the EMI which will affect the monthly budget is essential. Thus, before making any plan to take a loan, it is imperative to calculate the EMI – keeping in mind present and future incomes. When taking a loan, the rate of interest and the amount of principal are important in calculating the applicable EMI. The term of loan and processing fees are also important. Apart from these, there are other factors that are often neglected but they can also affect the EMI. Most of the bank offers a floating interest rate. It means that the interest rate is not fixed, but it changes with time. It will affect your EMIs. Sometimes, EMIs might slightly go on the higher side and sometimes they may lessen. If you are not able to repay the loan EMIs constantly and a large amount is unpaid, the bank may offer you to make a lump sum amount. This amount reduces your principal and thus reduces the interest thus reducing the EMIs in future. However, there might be some additional charges to avail this facility. Keep in mind, fixed EMI schemes do not mean the EMI will remain unchanged for the entire tenor. Most banks keep its limit to three years. If you extend or reduce the term of your loan, EMI will also change. If the term loan is extended, then the EMI reduces however if the term loan is reduced then the EMI increases. 1) Is EMI calculator the same for all kinds of loans? You can take a home loan, car loan, personal loan or education loan. The concept of principal, interest, repayment time, etc. remains similar. Thus, they all can be calculated by the same EMI calculator. However, there might be a difference with other factors such as location and special schemes, and this will reflect in the loan amount. 2) Are calculators more accurate than manual or excel calculation? Though they all use the same formula, technically, they are all equally accurate if all the figures and formulas are correctly entered. However, there is a risk of errors in manual and excel calculation of using the wrong formulas. 3) Is there any difference between the EMI as shown by the calculator and actual? If the amount of loan is accepted as it is, then there are few factors that might change the actual EMI a bit. The first factor is the interest rate. It might change from the time you applied for Loan and when it was accepted. Please note the free online tool gives the approximate amount and it is better to get a representative from the financial institution to give you the exact figure. 4) Is it a good idea to use EMI Calculator? Absolutely. It is convenient, fast and accurate. There is no reason not to use it. Also, it helps you understand the EMI and whether you have the capacity to repay in installments. It calculates calculations errors too. 5) Does, EMI calculator takes into the account that. I might default few EMIs? No, when an EMI has defaulted, bank charges a penalty to the borrower. This differs from bank to bank and differs for the amount of EMIs defaulted. These factors are not considered while calculating EMIs. 6) Can EMI change with time? Yes, most of the banks offer a floating rate of interest. It means that the interest rate might change with time. Also, if the interest rate increases, some banks may ask you to keep the same EMI amount but increase the loan tenor. 7) What is EMI payment? I have used Personal Loan EMI Calculator and got printed all the calculations within few seconds. Now i know how much i need to pay on monthly basis to lender as EMI for my upcoming personal loan. Good to read whole content very helpful for users and use of easy calculators given on this page.